Nothing says romance like floating down the canals of the Last Venue of Amore. Ride the waterways, basking in the rich history of this venue that time forgot, but whose love remains eternal. • Connect canal pieces together to make a loop. 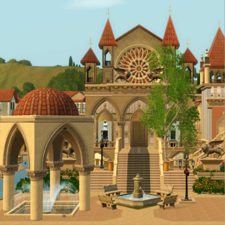 • Place Canal Entrances in locations where you want the Gondola to make stops. • Place a Gondola on one of the Canal Entrance pieces. • Queue up romantic interactions for your Sims when they find a secluded enough location!